A little-known material has the potential to revolutionize weapons technology. The specific upgrades are two extra panels that give the radar increased range and a 360-degree field of view for little extra cost. Gallium nitride can carry higher voltages than other semiconductor materials, meaning higher efficiency, which in turn means less power is required for the operation of the radar. This, according to Patriot upgrade program director Norm Cantin, makes the radar system more reliable and cheaper to maintain in the long-run. He notes that the pecuniary benefits for the U.S. defense industry will be “unquestionably” bigger from the sale of gallium nitride than from lethal drone exports: “Gallium nitride is an embedded technology in potentially a vast array of systems, whereas armed drones are really one relatively narrow product category.” Germany and Poland have both voiced interest in the purchase of the Patriot missile-defense system. 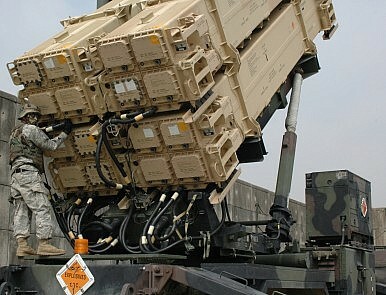 The export authorization of gallium nitride may help Raytheon convince both countries to go for its military hardware. Jack Cartland notes that “GaN is playing an integral role in developing more reliable military radars that can be five times more powerful than traditional systems or only half the size.” Of course, this claim is hard to independently verify. Loren Thompson emphasizes that the American defense contractor has spent a fair amount of time and money on the development of gallium nitride material: “Raytheon has spent a decade investing in gallium nitride. They’ve even built a foundry in Andover, Mass. to build their own chips.” This means that some of Raytheon’s claims may be overstated for marketing purposes.